Highlights: Arches National Park contains the world's largest concentration of natural stone arches. This National Park is a red, arid desert, punctuated with oddly eroded sandstone forms such as fins, pinnacles, spires, balanced rocks, and arches. The 73,000-acre region has over 2,000 of these "miracles of nature." Monument Valley was created as material eroded from the ancestral Rocky Mountains, and was deposited and cemented into sandstone. Visiting the valley is a thrilling experience. As you crest a hill or round a curve, a unique world unfolds before you. The present scene is little changed from that which Hollywood fell in love with in 1938 (when John Wayne and John Ford came to the valley to film Stagecoach). Antelope Canyon is at once one of the most breathtaking and tranquil places on earth. It is really two separate canyons - Upper and Lower Antelope. Each contains the hidden "slots" carved from the swirling sandstone, and both drain from the south into Lake Powell (once the Colorado River). * 3:30PM, Please meet Lassen Tours’ staff member at Excalibur Hotel “Lassen Tours Check-in Counter”. “Lassen Tours Check-in Counter at Excalibur” is located at the main level of the hotel rear entrance. It will be on your right hand side after entering the rear door. Hotel address – 3850 Las Vegas Blvd, South, Las Vegas, NV 89109. * Hotel rooms are typically designed and equipped for two travelers. They usually feature a queen- or king-sized bed or two double beds, which are meant to provide adequate comfort for two travelers. * 3rd person, 4th person or child must share with the 1st & 2nd travelers in the same room (2 double beds). Extra beds, extra items and services (such as extra toiletries and towels) will not be provided. * Hotels limit occupancy based on local or state fire codes, no more than 4 people to occupy a hotel room, regardless of the ages of the occupants. * Child fare: for children 2 years of age and above, occupying the same room with 2 adults. * Children under 2 years old will be charged $25 per day for mandatory General Liability Insurance. It is also to guarantee a seat for the child. If the parents prefer to hold the child, it is considered as forfeiting the seat, but the $25 Per day General Liability Insurance will still be charged. Saturday 3:30pm, Please meet Lassen Tours’ staff member at Excalibur Hotel “Lassen Tours Check-in Counter”. *Emergency contact phone numbers: (415) 260-4181and (800) 910-9888. Tonight will be to your leisure. Accommodations will be at the Excalibur Hotel & Casino, named for the mythical sword of King Arthur. Immerse yourself in the castle themed resort right in the middle of the Las Vegas Strip. Choose from one of the many eateries on the property, including the Roundtable Buffet, or head down the Strip and stop by one of the other world famous hotels. Depart Las Vegas in the morning and visit arguably the two of the most scenic National parks in Southern Utah. Zion is colored with reddish and tan-colored sandstone with soaring cliffs and great basins. Contrast that to Bryce which is not a true canyon, but an amphitheater of magnificent red rock formations within the high Colorado Plateau created by erosion. Each dense eroded columns known as hoodoos, create an out of this world landscape. These two National parks are truly a photographers’ heaven. Tonight we will stay in the town of Bryce Canyon City. Utah contains one of the largest concentrations of natural sandstones in the world. The arches and numerous other extraordinary geologic features, such as spires, pinnacles, pedestals and balanced rocks, are highlighted in striking foreground and background views created by contrasting colors, landforms and textures. The park is 73,379 acres in size. hike the famous “delicate arch” in the late afternoon hour. Overnight stay in Monticello. Monument Valley is characterized by a cluster of vast and iconic sandstone buttes, the most photographed place in America Southwest. It has been featured in many western movies and TV commercials since 1930s. We may have a chance to take the optional jeep rides to see all the famous scenes led by the Navajo Indians. Canyon De Chelly, Chelly means “canyon” in Navajo language. Millions years of land uplifts and steams cutting created the colorful sheer cliff walls of Canyon De Chelly. Petrified Forest National Park contains some of the largest and best-preserved petrified wood sites in the world. The combination of Petrified Forest and Painted Desert provides us with an extraordinary diverse fossil records that cannot be found elsewhere. Overnight stay in Holbrook. Walnut Canyon National Monument was established to preserve numerous Prehistoric archaeological sites and the ancient cliff dwellings. Evidence of human use can be traced back over 2,000 years ago. Most of the cliff dwelling rooms are situated near the loop trails (0.9 miles). 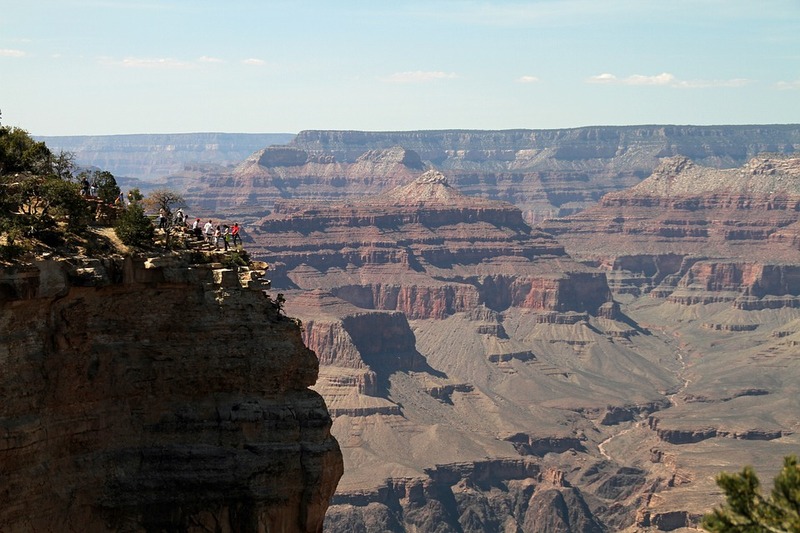 The Grand Canyon offers one of the most spectacular examples of erosion not found anywhere in the world. Canyon National Park is a designated World Heritage Site and is unmatched in the incomparable vistas that it offers to visitors on the rim. Horseshoe Bend is the name for a horseshoe-shaped meander of the Colorado River. Over night stay in Page. Lake Powell, a reservoir on the Colorado River, straddling the border between Utah and Arizona. It is the second largest man-made reservoir in the United States behind Lake Mead, storing 24,322,000 acre feet (30 km³) of water when full. We may have a chance to take an optional cruise on the scenic Lake in the morning. We will continue to visit Antelope Canyon around noon time. The canyon is known as a slot canyon in which rainwater, especially during monsoon season, runs into the extensive basin above the slot canyon sections, as the water rushes into the narrow passageways, over time the passageways are eroded away, making the corridors deeper and into what you would experience today. We will travel back to Las Vegas in the afternoon and stay once more at Excalibur Hotel and Casino. Our tour services end in Las Vegas. You may elect to stay behind or take a flight from Las Vegas to your next destination (transfer out service excluded).